Advances in image quality in recent decades have made it necessary to develop new technologies for producing displays to meet remarkably stricter standards. The display market is governed mainly by liquid crystal display and light-emitting diode (LED) technology; however, it suffers from limitations that can be overcome by developing the next generation of electroluminescent displays. 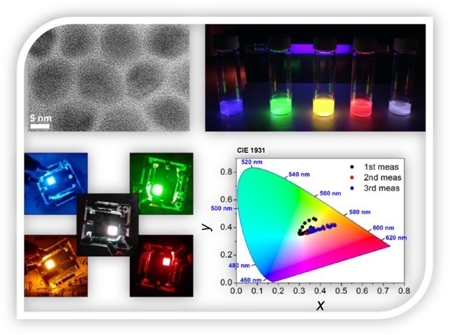 The introduction of colloidal quantum dots (QDs) as down-converters has enabled the production of displays with extremely high color purity and gamut. 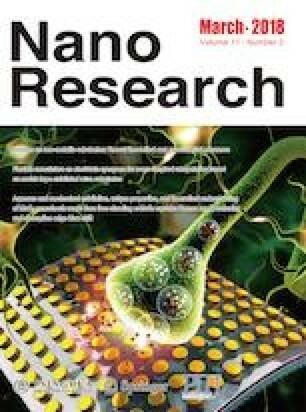 Therefore, colloidal nanocrystals are excellent candidates for the preparation of electroluminescent devices, which represent a straightforward approach to the development of unprecedented high-quality displays. We synthesized light-emitting QDs covering the entire visible spectrum with high fluorescence quantum yields and color purity, and produced high-brightness single-color LEDs with external quantum efficiencies of 0.39%, 1.04%, 2.10%, and 1.30% for red-, orange-, green-, and blue-emitting dots, respectively. Additionally, white LEDs were prepared by mixing QDs; they showed color temperatures of 5,300 K and color rendering indices exceeding 80%. Very importantly, we exhaustively characterized the LED performance, including the response time, stability, and evolution of the light characteristics, thus providing crucial information toward the development of high-quality electroluminescent displays. Supplementary material (characterization equipment, HR-TEM images, evolution of the chromaticity indexes, transient PL decay of the blue QDs film, EL at different applied potentials, evolution of the normalized EQE, response time of the turn-on and turn-off processes) is available in the online version of this article at https://doi.org/10.1007/s12274-017-1773-2. The work was supported by MINECO of Spain (No. MAT2016-76892-C3-1-R) and by Generalitat Valenciana (No. PROMETEOII/2014/020). B. C. H. is grateful to the support of the National Council of Technological and Scientific Development (CNPq), Brazil, through the Science without Borders program.